Meaning of starch enables us to better understand the pros and cons. Meaning of starch enables us to better understand the pros and cons of carbohydrate. Nowhere in the world of diets is there more confusion than about the role starches play in the growing obesity of the Western world. Many say you must avoid them in totality, others that in moderation they are fine, and still further dieticians are saying that it is only the simple carbohydrates that are problematic. It's based largely on opinion, rather than scientific fact, and is usually grossly oversimplifying a very complex subject. So, what is the meaning of starch? A starch molecule consists of a large chain of glucose molecules joined together; there are two types. A long chain of glucose units which is unbranched, but curls itself into a helical shape, making it difficult to digest; it's called amylose. (25%). Amylopectin on the other hand consists of a very large number of glucose units, up to hundreds of thousands, that are highly branched; this means they are easily digested in the small intestine by the enzyme amylase. (75%). The ratio of amylose to amylopectin varies in different carbohydrates, but typically is about 1 part to 4. Long chains of glucose molecules are called polysaccharides; it's how plants store the energy they collect from the sun, and are the chief source of energy in humans who eat plants. Starches are typically found in potatoes and corn, for example, but also in fruit like apples, and in legumes; they are everywhere in virtually all foods. Remember that amylose, the one quarter fraction, is difficult to digest and is known as 'resistant starch'; it gets through to the large intestine where it's not easily digested by enzymes that would form glucose, but fermented by the normal flora producing healthy short chain fatty acids like butyrate; this compound is an important marker of a happy colon; if it's only found in small quantities, then all sorts of unhappiness occurs in the body; there's a sharp rise in the autoimmune diseases like lupus and rheumatoid arthritis. Put differently, feeding the microbiota in the colon is important; if all the starch is digested in the small intestine leaving none for the bugs, they starve and our bowels and overall health suffers. So, are you getting some understanding of the meaning of starch? Perhaps you are wondering, why on earth is a chiropractor writing blogs all about starch. Well, all health practitioners have a responsibility for the overall well-being of their patients, and not just the subluxations in their spines, caries in their teeth, and pathogens in the sinuses or bladders. What we eat, and whether we exercise, probably has a more profound influence on how long we live, and the quality of that life, than these other lesser important criteria. So, to summarise, amylose or resistant starch, because of the helical nature of the molecule, is not well digested by the enzymes in the small intestine and tends to reach the colon. Amylopectin on the other hand is highly branched, and rapidly digested and absorbed in the small intestine, giving a blood sugar rush, outpouring of insulin, and then stored in adipose tissue. Meaning of starch will enable you to grasp which of the carbohydrates, and how they are prepared, will make you fat. So, we should be looking for those carbohydrates that are slowly digested in the small intestine, forming small amounts of glucose that is rapidly absorbed, whilst most of the starch reaches the colon where it is fermented rather by the bugs known as our normal flora. 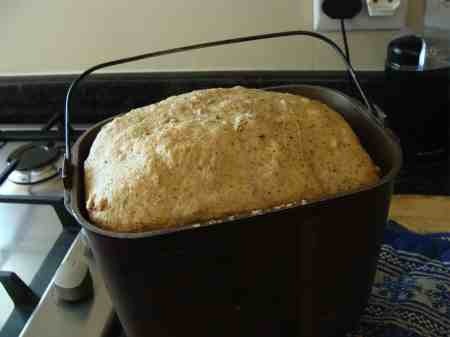 How that carbohydrate is prepared in the kitchen has a profound effect on how it is digested. Let's start by considering potatoes, a staple in most of our diets. If you deep fry it, it has an extremely high glycemic index; it's very rapidly digested and absorbed in the small intestine. Likewise, though to a lesser extent, the same is true of boiled potatoes and mash. That's not a good idea and, if eaten every day, will make you obese and set you on the road to weight gain and insulin resistance. That's particularly true of the russets. 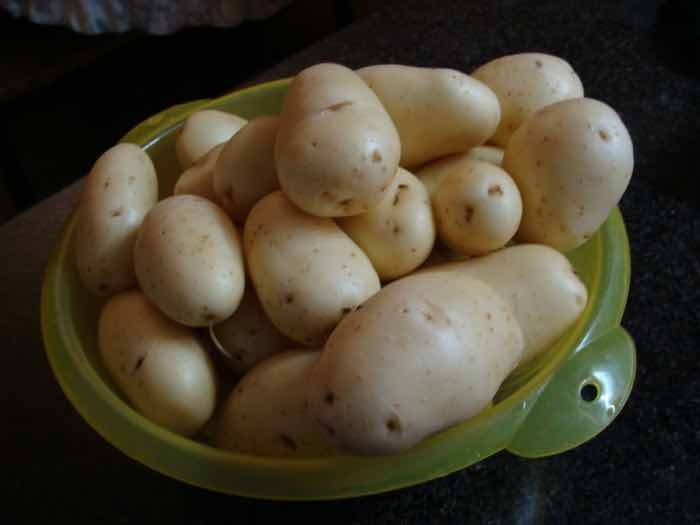 Instead, enjoy rather red and new potatoes that form a creamy, smooth mash; they have a greater proportion of resistant starch and more is likely to reach the colon undigested. Are you beginning to grasp the meaning of starch? Diabetics thus can often enjoy new potatoes that cause only the normal postprandial rise in blood sugar; two hours later their finger pricks are normal. Test yourself though to be sure. They tend to be expensive and one is never sure just how new they are; the best solution is to learn how to plant potatoes. Better still, allow it to cool overnight in the refrigerator, and then reheat the next day; it takes some planning, but the starch undergoes retrogradation making it yet more difficult for the enzymes to digest in the small intestine. Chilling and then reheating resistant starch is a good way to feed those bugs in the colon. Another is by enjoying these kefir benefits every day; it's so easy to make at home. The bacteria and yeast probiotics will do a wonder for your colon. Vichyssoise, the way the French would enjoy our Irish potato leek soup, employs this principle of retrogradation; they enjoy it cold. 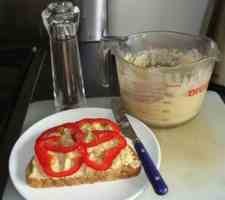 An alternative, perhaps even better, would be to cool it overnight and then reheat it the next day for a meal. Through what I can only describe as wicked, fake reporting, millers are allowed to describe their flour as 'wholemeal' provided they remove less than 40% of the germ and bran. Thus you will read that 'wholegrain bread' has a high glycemic index; and so it does, if you buy it from the supermarket. You should avoid it. This kind of false reporting only serves to confuse us when trying to grasp the meaning of starch. After all, surely wholegrain bread should be low GI; and so it is if you use real 100% wholegrain meal. There is a revolution happening in the world of baking, demanding 'real bread' that is made from 100% wholemeal. Frankly it's still very difficult to find and you certainly won't discover it in the local supermarket. You may be lucky to have a specialist baker in the district, but most likely you will have to bake your own low GI bread; it means having a wheat grinder. The upside is that it takes only five minutes to prepare, tastes divine, costs half the price of the local loaf and, considering the meaning of starch, is very resistant to digestion in the small intestine and certainly won't make you obese. Personally, I bake our low GI bread most days; it really only takes five minutes including the grinding of the 100% wholemeal flour, and tastes absolutely divine. Whilst previously, eating so-called whole grain bread, I found it necessary to us various jellies, knowing full well that the sugar did me no good, or hams and polonies fully understanding that processed meat means a high likelihood of cancer; or peanut butter with the possibility of aflatoxin; from the supermarket it tastes simply utterly boring unless it's dickered up. Now our own low GI bread, and even more our what is artisan bread which tastes so divine that I rarely add anything more than butter; it simply needs nothing else to make my fussy tongue happy. Understanding about the carbohydrate count chart is important too, and will you help your understanding. 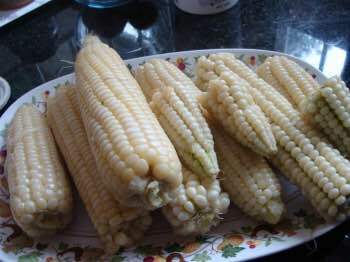 I am yet to find out exactly the meaning of starch concerning fresh corn on the cob but I presume that like new potatoes the amount of resistant starch is significantly higher if you pick them young; despite enjoying it daily for three months in the year, straight from the garden, neither the good wife nor I have put on a pound; in fact we've lost a few. Once your starches have sat in cold storage, or at the green grocer for a few days, it appears that not only does the taste regress, but less of the starch passes safely through the small intestine undigested, meaning a rise in blood sugar and the threat of insulin resistance. Diets like the Paleo and Banting assume that you will not be able to enjoy fresh corn on the cob, new potatoes, or 100% whole grain bread; for the majority that could be true. But once you understand the meaning of starch, you no longer need to live in terror of enjoying carbohydrate. If we want to enjoy our carbs without an unhealthy increase in our waistlines, then we either have to grow them ourselves, or frequent the farmers' markets for fresh veggies, and bake our own bread. There is no other way. Obviously I'm recommending how to grow corn. The first signs of corn in flower is a day of rejoicing in our household. Unfortunately, if you're banting or on the paleo diet, this quick succotash recipe is out of the question; both the corn and lima beans are high in starch. 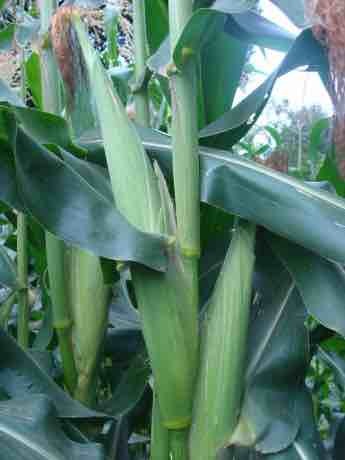 Nevertheless, depending on which variety of maize you are using, both have a low glycemic index; neither are fattening as they have largely resistant starch. Legumes like chickpeas, beans and lentils whilst being the main source of protein for most of the people of the world, also have a lot of starch. For this reason they are banned from the menus of those following the paleo or banting diets; erroneously so, I believe. Once you understand the meaning of starch, you'll understand why. The reason is that most, with the exception of fava beans, have a very low glycemic response to legumes; they have a higher proportion of amylose, the resistant starch, and a lot of fibre. Also, adding protein to a starch, lowers the glycemic index; it's built in to the legumes. All in all, legumes are not a threat to the waistlines of those seeking to lose weight; they simply do not produce an abnormal postprandial rise in blood sugar; they are not fattening. Instead, knowing about resistant starch, and avoiding the easy starches in the main is the way forward. The other obvious response to those advocating these low carb diets is that they must then get their protein from an animal source; it's neither affordable for the majority, nor is it healthy. You'll more likely die of cancer instead; and even worse story than sudden death from a heart attack. In short, understanding the meaning of starch means we have a much better opportunity of achieving meaningful weight loss in a healthful way. Legumes, real bread and freshly picked starches are not the cause of obesity. We know what is; those carbohydrates that are rapidly digested in the small intestine causing a surge in blood sugar, outpouring of insulin and deposition in the adipose tissue. The first step to losing weight permanently in a healthy, sane way, is to forget the word 'diet'. Eradicate it from your vocabulary and thinking; it's a dirty four letter word, because none of them work. Understanding the meaning of starch and its role in the healthy menu, searching out for the real, slow food that our great grandparents ate is the way to a modest waistline. So, what is your BMI? This will tell you how important it is to get started on this journey. Use a full stop, not a comma in your height and weight. Are you in the dark green? Misery lies ahead if you don't do something soon. Start today by purchasing some seeds for the garden, buy a packet of dried chickpeas, for which you will really need a pressure cooker, or else a long boil, making your own hummus, see the navigation bar on the left for a delicious recipe, and find a local farmers' market. Good luck, it can be done. Our healthy hummus recipe, or other legumes, 100% real bread and fresh vegetables and fruit straight from the garden or green grocer is the way I recommend to lose weight. It's sustainable, healthy and absolutely scrumptious; the banting diet modified if you insist on a diet plan, is reasonable. Better still, just grasp the meaning of starch and follow your own inner sense; those nasty diets just don't work; only 5% of people one year later have actually lost weight, and many have put on. Let me say it again, the word diet is a dirty four letter word! Rather look to this glycemic index calculator to decide which foods are making you fat, and which are kosher. The way we prepare a starch has a profound effect on the way it's absorbed in the alimentary canal. For example, if you've been planting sweet potatoes you will probably be astonished, as I was, to discover that both the glycemic load and the index are dramatically different when comparing boiling vs baked. Nutrition is a complex subject, and I hope this contributes to your understanding of the meaning of starch. It's sad perhaps, but a fact, that baked sweet potatoes have a very high glycemic index of 94; they are absorbed in the small intestine and instantly raise the blood sugar. That makes them very fattening. But a boiled sweet potato, as in our butternut soup recipe, has a low GI of 44; that makes it a very healthy starch that is not in the slightest fattening; much of it passes through the small intestine undigested, and instead feeds the microbiota in the colon producing healthy short chain fatty acids instead of glucose; it's not fattening and also gives protection against the neurodegenerative conditions like Alzheimer's and Parkinson's disease. Boil your starches, don't bake or roast them if you care more for your health than the dictates of your tongue. And better still, after cooking refrigerate them overnight and reheat them before enjoying them, so that retrogradation can occur. Understanding these matters is what better health is all about; grasping why simple carbohydrates are not all bad, and complex starches are not all good, is part of it. You can read more about this anathema at simple vs complex carbohydrate. Jack Sprat and his wife Noleen enjoyed exactly the same food but, despite together licking the platter clean, he was thin as a rake, and she was enormous. How can that be? Noleen's liver and muscles were unable to utilise blood sugar in the normal way; she is carbohydrate resistant. It's partly genetic, but also induced by a diet high in refined carbohydrates. Probably as a child she was allowed unlimited candy and icecream, but Jack's mother said that he could only have them now and then. There's only one solution: Noleen has to avoid all refined carbohydrate, and even whole carbs have to be taken in moderation. The best test is the HbA1c. It should be below 5%. Currently there is no other known way of dealing with carbohydrate resistance; if Noleen refuses she will first become obese, then insulin resistant and finally diabetic. Then her toes will start to fall off, she'll go blind and drop off the planet long before her time from a heart attack or stroke; not pleasant and quite unnecessary. Actually, it's a blessing now that she understands the meaning of starch; she'll be much healthier for avoiding sugar and cake flour, and getting to know about the natural carbohydrates and joining those doing a victory dance when she sees the first corn or potatoes in flower; she can enjoy them fresh from the garden in moderation. Beer of course contains a lot of starch; 26g of alcohol and maltose to be more precise. That's more carbohydrate than a diabetic should have in the whole day. But what about the rest of us, whose weight is good, diet wholesome and get plenty of exercise? I set out to measure my glycemic response to beer; your body will of course react differently, and if you have a weight problem, suspect you may be prediabetic as I am, and want to live into your eighties, then I recommend you get a glucometer and test yourself. My most significant discovery is that if I take a short ten minute walk after a starchy meal, it will completely stop a surge in blood glucose; but if I sit down at the computer after lunch, it rises to unacceptable heights.